The Boston Bruins are teaming up with Velcro Companies to launch the second annual “Battle of the Books” competition. The organizations invite classrooms in schools across New England to enter their favorite book into a bracket-style competition in which students and educators vote to select the ultimate winner. By adding friendly competition with Bruins-themed and VELCRO® Brand prizes, the Boston Bruins and Velcro Companies aim to generate enthusiasm for reading and literacy amongst students of all ages. To kick-off the competition, each classroom selects sixteen books, reading through two at a time and voting on that winner. As with sports, each winning book advances to the next round, culminating in a “Battle of the Books” winner. This year’s competition features new and bigger prizes for students and classrooms including a Boston Bruins BFit School Assembly featuring high-energy and festive activities and the Bruins’ mascot, Blades. 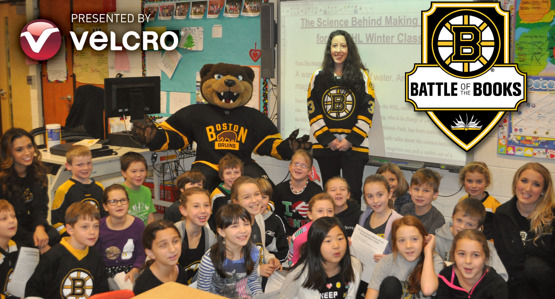 Together, the Bruins organization and Velcro Companies will provide weekly prizes for select classrooms based on photo submissions. Among the grand prizes are $500 Amazon gift cards and a large supply of VELCRO® Brand products for classroom organization and décor. All school classrooms are eligible to participate. For more information please visit BostonBruins.com/Battleofthebooks.